In Plato's time, books as we know them today didn't exist, of course, as printing was invented only about twenty centuries after he died ! Texts that were made available to the litterate public were most often written on rolls of papyrus, in several columns, and the reader had to unroll the roll of papyrus to move from column to column, and to roll it back all over after he had finished reading, the make it ready for a new reading. 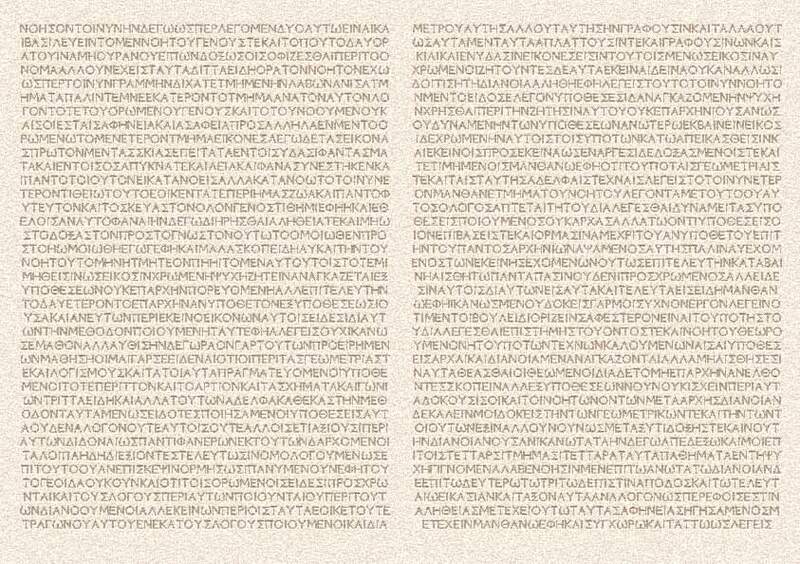 This picture is not a photograph of an old papyrus from Plato's time, but a reconstruction I made to give a flavor of what a reader in Plato's time would see. 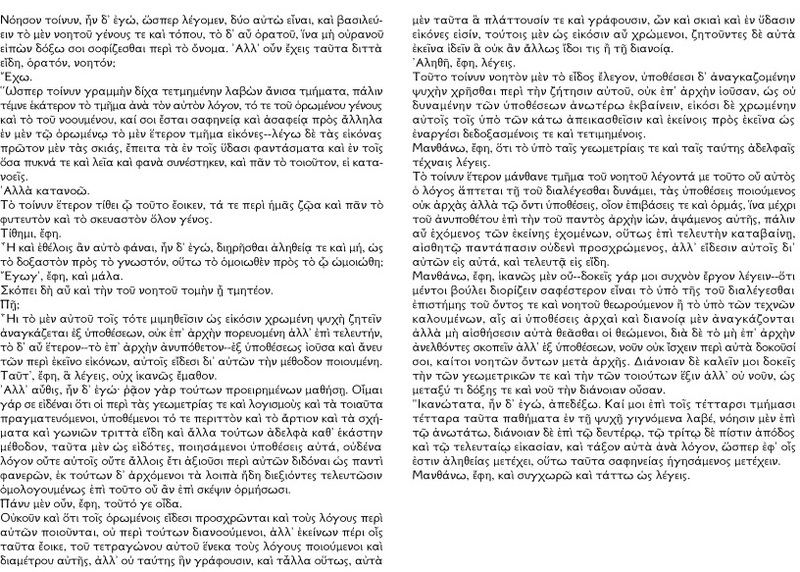 The style of the characters might not be exactly the one used at the time, as I used, for my reconstruction, one of the fonts available at Perseus, and the height and length of the columns maight have been different in his time, but the general appearence is the same, and this example allows us to realize how hard reading might have been in Plato's time. This may help explain too how such a writing technique could lead to mistakes in interpreting a text, if the reader didn't split the words as intended by the writer, or took a word for another one of the same spelling, that could only be distinguished by differences in accents and breathing not invented yet (and that were invented precisely to note differences in stress and pronounciation that existed when speaking). Note, by the way, that this is about what we do everyday to understand oral speech, in which there are no accents, no punctuation marks, no "spaces" between words. The only difference is that, in oral speech, the speaker may vary his tone and insert silences between phrases to help in understanding. Hôsper toinun grammèn dicha tetmèmenèn labôn anisa tmèmata, palin temne hekateron to tmèma ana ton auton logon, to te tou horômenou genous kai to tou nooumenou, kai soi estai saphèneiai kai asapheiai pros allèla en men tôi horômenôi [509e] to men heteron tmèma eikones--legô de tas eikonas prôton [510a] men tas skias, epeita ta en tois hudasi phantasmata kai en tois hosa pukna te kai leia kai phana sunestèken, kai pan to toiouton, ei katanoeis. To toinun heteron tithei hôi touto eoiken, ta te peri hèmas zôis kai pan to phuteuton kai to skeuaston holon genos. [510b] Egôg', ephè, kai mala. Skopei dè au kai tèn tou noètou tomèn hèi tmèteon. Hèi to men autou tois tote mimètheisin hôs eikosin chrômenè psuchè zètein anankazetai ex hupotheseôn, ouk ep' archèn poreuomenè all' epi teleutèn, to d' au heteron--to ep' archèn anupotheton--ex hupotheseôs iousa kai aneu tôn peri ekeino eikonôn, autois eidesi di' autôn tèn methodon poioumenè. Taut', ephè, ha legeis, ouch hikanôs emathon. [510c] All' authis, èn d' egô: rhaion gar toutôn proeirèmenôn mathèsèi. Oimai gar se eidenai hoti hoi peri tas geômetrias te kai logismous kai ta toiauta pragmateuomenoi, hupothemenoi to te peritton kai to artion kai ta schèmata kai gôniôn tritta eidè kai alla toutôn adelpha kath' hekastèn methodon, tauta men hôs eidotes, poièsamenoi hupotheseis auta, oudena logon oute hautois oute allois eti axiousi peri autôn didonai [510d] hôs panti phanerôn, ek toutôn d' archomenoi ta loipa èdè diexiontes teleutôsin homologoumenôs epi touto hou an epi skepsin hormèsôsi. Panu men oun, ephè, touto ge oida. Oukoun kai hoti tois horômenois eidesi proschrôntai kai tous logous peri autôn poiountai, ou peri toutôn dianooumenoi, all' ekeinôn peri hois tauta eoike, tou tetragônou autou heneka tous logous poioumenoi kai diametrou autès, all' ou [510e] tautès hèn graphousin, kai talla houtôs, auta men tauta ha plattousin te kai graphousin, hôn kai skiai kai en hudasin eikones eisin, toutois men hôs eikosin au chrômenoi, zètountes [511a] de auta ekeina idein ha ouk an allôs idoi tis è tèi dianoiai. Touto toinun noèton men to eidos elegon, hupothesesi d' anankazomenèn psuchèn chrèsthai peri tèn zètèsin autou, ouk ep' archèn iousan, hôs ou dunamenèn tôn hupotheseôn anôterô ekbainein, eikosi de chrômenèn autois tois hupo tôn katô apeikastheisin kai ekeinois pros ekeina hôs enargesi dedoxasmenois te kai tetimèmenois. [511b] Manthanô, ephè, hoti to hupo tais geômetriais te kai tais tautès adelphais technais legeis. To toinun heteron manthane tmèma tou noètou legonta me touto hou autos ho logos haptetai tèi tou dialegesthai dunamei, tas hupotheseis poioumenos ouk archas alla tôi onti hupotheseis, hoion epibaseis te kai hormas, hina mechri tou anupothetou epi tèn tou pantos archèn iôn, hapsamenos autès, palin au echomenos tôn ekeinès echomenôn, houtôs epi teleutèn katabainèi, [511c] aisthètôi pantapasin oudeni proschrômenos, all' eidesin autois di' autôn eis auta, kai teleutai eis eidè. Manthanô, ephè, hikanôs men ou--dokeis gar moi suchnon ergon legein--hoti mentoi boulei diorizein saphesteron einai to hupo tès tou dialegesthai epistèmès tou ontos te kai noètou theôroumenon è to hupo tôn technôn kaloumenôn, hais hai hupotheseis archai kai dianoiai men anankazontai alla mè aisthèsesin auta theasthai hoi theômenoi, dia de to mè ep' archèn [511d] anelthontes skopein all' ex hupotheseôn, noun ouk ischein peri auta dokousi soi, kaitoi noètôn ontôn meta archès. dianoian de kalein moi dokeis tèn tôn geômetrikôn te kai tèn tôn toioutôn hexin all' ou noun, hôs metaxu ti doxès te kai nou tèn dianoian ousan. Hikanôtata, èn d' egô, apedexô. kai moi epi tois tettarsi tmèmasi tettara tauta pathèmata en tèi psuchèi gignomena labe, noèsin men epi tôi anôtatô, dianoian [511e] de epi tôi deuterôi, tôi tritôi de pistin apodos kai tôi teleutaiôi eikasian, kai taxon auta ana logon, hôsper eph' hois estin alètheias metechei, houtô tauta saphèneias hègèsamenos metechein. Manthanô, ephè, kai sunchôrô kai tattô hôs legeis. A translation in French by me of this text is available on this site, for those who read French. To go to it, click here.